Foreign ministers participating in the 15th Bay of Bengal Initiative for Multi-Sectoral Technical and Economic Cooperation (BIMSTEC) Ministerial Meeting on Friday made a visit to Chandragiri Hills for a short retreat. 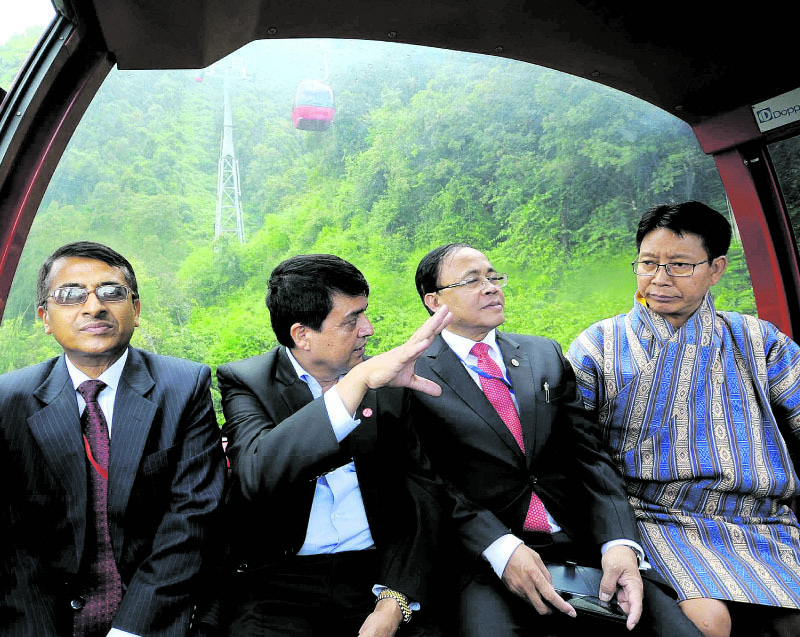 Issuing a statement, Chandragiri Hills Ltd said Deputy Prime Minister and Minister for Foreign Affairs, Krishna Bahadur Mahara; Foreign Minister of Bhutan Damcho Dorji, and Minister of State for Foreign Affairs of Myanmar, U Kyaw Tin, enjoyed a cable car ride to the hill station. Chandra Prasad Dhakal, the chairman of Chandragiri Hills, along with company directors Hem Raj Dhakal, Ambika Prasad Paudel, Navaraj Nepal and Kalyan Gurung welcomed the visiting foreign ministers on the Chandragiri Hills premises, according to the statement. “During the visit, Chairman Dhakal introduced the project to the ministers and briefed them about the company’s future projects,” read the statement. Situated at the south-east of Kathmandu Valley, Chandragiri Hills is significant from historical, religious and tourism point of view. This establishment has a purpose of boosting internal tourism as well as luring international tourists and extending their length of stay by least a day. Bhaleshwor Mahadev can be reached via cable car form the bottom station which is situated on the height of 1569 metres above sea level. Several facilities like, restaurants, bar, conference hall, children’s playground is available at the hill top. 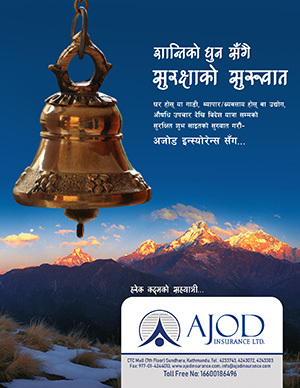 The beautiful Kathmandu valley can be seen from the view tower located at the height of 2547 metres above sea level. The duration of air travel from Dhangadhi to Kathmandu, the longest among the domestic routes, has come down to 48 minutes, and that’s all possible due to the new jet aircraft of Shree Airlines that started flights in this sector on Friday. The carrier received an air operator’s certificate (AOC) from the Civil Aviation Authority of Nepal (Caan) on Thursday, 11 months after obtaining operating authorization from the Civil Aviation Ministry. It used to take 1 hours and 10 minutes to reach Kathmandu from Dhangadhi on other aircraft. The commercial operation of jet aircraft by Shree Airlines has come for the comfort of the travellers. Shree is the biggest helicopter service provider in Nepal, which has now started operating passenger aircraft. At a formal event organized for welcoming the staff and the crew, Chief District Officer Govinda Rijal appreciated the introduction of jet aircraft in the Kathmandu-Dhangadhi sector. Rajesh Khati, a local who travelled by the Shree Airlines plane said the journey was shorter and more enjoyable. “Locals will benefit from the jet aircraft,” he said. More than half of the tickets for Saturday were booked on Friday. “Along with this, four flights have come into regular operation,” said Chief of Dhangadhi Civil Aviation Office. “There used to be more than 1,400 passengers who complained of lack of tickets even when three regular flights operated every day. Now we hope the situation will become better”, he added. Shree’s entry into fixed-wing services is likely to end the duopoly of Buddha Air and Yeti Airlines on trunk routes. Shree received a no objection certificate from Caan in March to buy or lease aircraft. Although Shree had planned to launch commercial operations by the end of 2016, stringent AOC requirements forced it to push back it’s launch date. The carrier has also set an ambitious plan to connect South Asian markets in the second phase. Currently, it has an international operation licence for its MI-17 helicopters only. Started in 1999, it currently has six MI-17 and four Eurocopter AS350 B3e helicopters.